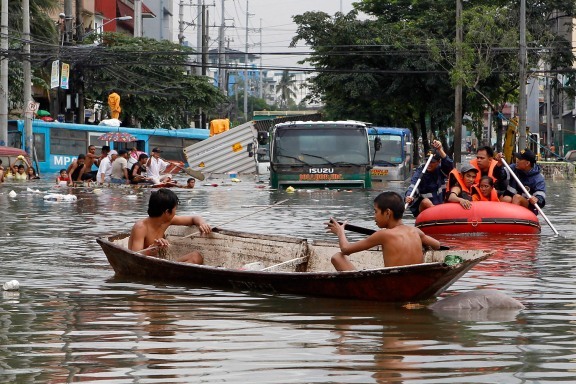 Almost 2 million Filipino people were inundated by floods and more than 300,000 were evacuated to safer places due to heavy downpours that hit the Philippines. 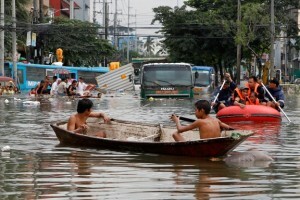 Half of Manila, the capital city, has been submerged when monsoon rains caused rivers, dams and waterways to overflow and set off flash floods to the capital region and nearby provinces. Just recently, the country has already experienced heavy rains and flooding caused by Tropical Storm Saola which also hit Taiwan and China. Authorities considered the disaster as the worst flooding since 2009 with more than 3000 homes damaged and 19 people killed. The deaths were caused by drowning and electrocution. The deadly flood has paralysed not only the city but also the surrounding provinces and municipalities. Classes and work were suspended in all areas that were declared in the state of calamity. According to reports, the flood water in some areas was higher than waist deep. Roads were impassable, cars were stranded and power was cut off. The normal summer monsoon has brought scattered showers and thunderstorms causing flash flooding in most places over the Luzon Island. There were reported landslides in some areas killing people and destroying homes. Relief operations have been in placed as authorities rushed to areas greatly impacted by the floods. Priority was given to those people who were in the evacuation centers and in need of food, water, clothes and medicine.